A view forward to 2020 there will be an increase in entitlement spending as noted in the article per one of the President’s within the Federal Reserve district banks. With Baby Boomers moving to peak in claiming Social Security and Medicare benefits coupled with rising interest rates, my previous prediction of a rough year approximately 2019 doesn’t seem so radical. IMO 2019/2020 also aligns with a roughly typical 10-year cycle of consumer tentativeness, increased investing, and then fear brought about by roughly steady years of growth (albeit this time slow, low, and difficult to accept as rebounded). 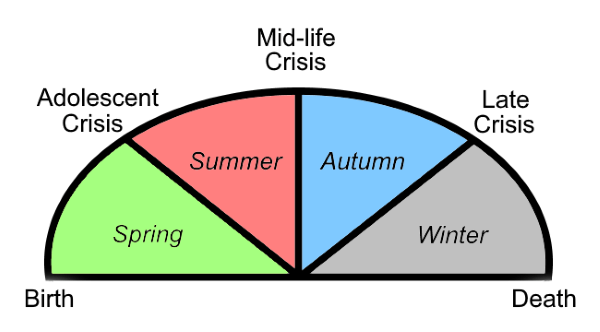 I like to think of this as a revolving Jungian Cycle limited to Summer and Autumn. I know there is plenty of debate on these issues but the economy has recovered to the point we’ve increased interest rates and with the entitlement wall approaching fast, beware the scare. Affordable Care is a beast and not quite perfect but in this humble opinion it is the one thing going to keep the Baby Boomers from a scary end and I for one am willing to swallow the dark, expensive pill as a Millennial, will you Gen X?